President-elect Donald Trump revived a controversy from America’s past when he recently expressed via Twitter his opposition to flag burning and flag burners. “No one should be allowed to burn the flag,” Trump tweeted on November 29. 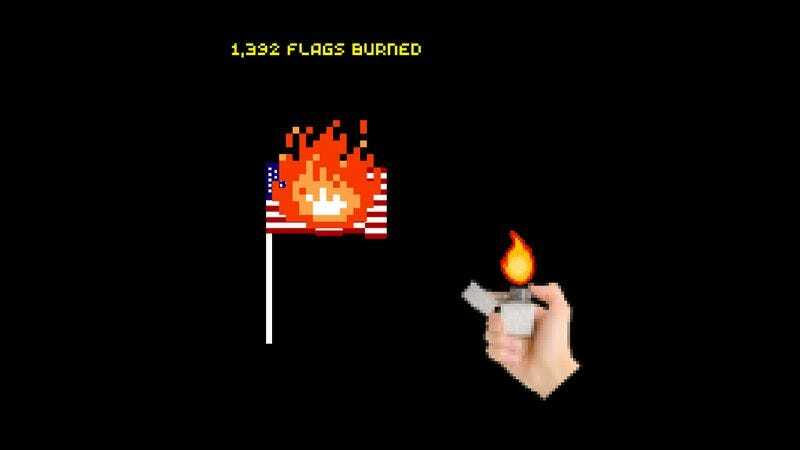 “If they do, there must be consequences—perhaps loss of citizenship or year in jail!” This odd, unprovoked announcement was the inspiration for a single-serving website called Burn The Flag (If You Want To). Here, visitors can symbolically torch a rippling, 8-bit American flag, waving proudly in an otherwise featureless black void. Your mouse controls a hand holding a lighter. Random as they may seem, Trump’s comments hearken back to the first George Bush, who in 1989 asked for an anti-flag-burning amendment to the Constitution. He could never make it happen during his own administration, but the issue came up for a congressional vote several times during the 1990s and 2000s. The Simpsons did a whole song about it. With Trump in the White House and Republicans controlling the House and Senate, maybe the Flag Desecration Amendment could actually happen this time. No word yet on other, even more controversial forms of flag-based protest.